It has been three years since the Japan External Trade Organization opened a trade information center in Kyoto, called "JETRO Kyoto" the equivalent to its office in Kyoto, in Shimogyo Ward, Kyoto City. JETRO Kyoto has started achieving results; to date, it has responded to approximately 2,300 requests for advice concerning trade investment, and it has also been involved in attracting foreign companies to Kyoto. In the future, it intends to follow a policy to strengthen support for Kyoto companies to expand overseas business. "It is important to further spread knowledge of Japanese sake in various localities." 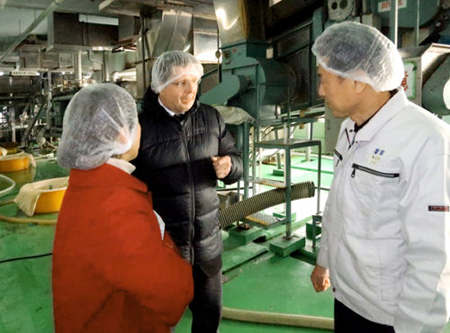 In late January, a man from an Australian food consulting company, who was invited to Japan by JETRO Kyoto, visited Kitagawa Honke Co., Ltd., a sake brewery in Fushimi Ward, Kyoto, and gave advice on popularization methods for refined sake. JETRO Kyoto has supported overseas expansion of companies since it was established in January 2015. A visit to Kitagawa Honke was a part of the project "Fushimi Sake Tourism" which began the previous fiscal year. The program aims to improve global recognition of the refined sake producing area "Fushimi." This time, five foreign buyers and others were invited to sake breweries in Fushimi. JETRO Kyoto's main mission is to support foreign trade for companies. The number of consultations about trade investment per month over the past three years climbed to 63 cases on average, an approximately threefold increase over what was received at the Osaka headquarters before JETRO Kyoto opened. The majority of the inquiries are from small-and-medium-sized companies, and eighty percent of those consultations are related to export and overseas expansion. The greatest number of inquiries are about Asia. Planning business negotiation events with foreign buyers, JETRO Kyoto has already held a total of nine projects related to items such as food, Japanese sake and fabric. As about 180 companies took part in the events, approximately 160 contracts totaling roughly 80 million yen are expected. JETRO Kyoto has been also involved in attracting foreign companies to Kyoto and has actually invited 10 foreign companies, including a major Australian travel agency and a Chinese industrial software development company. In addition, it introduced approximately 160 international students to 34 companies at an exchange meeting in order to utilize foreigners at small-and-medium-sized companies. >From here out, it plans to expand the scale of exchange meetings between international students and companies, and also create new business through economic exchanges that are underway between Boston, U.S.A and Kyoto. Furthermore, it has plans to relocate its office from its present site, "Kyoto Research Park," to a new Kyoto economy hub provisionally named "Kyoto Economy Center" which is scheduled to be completed in spring 2019 in Shimogyo Ward. Kenichi Ishihara, chief director of JETRO Kyoto, said, "Kyoto enterprises are motivated to expand overseas. Recently, foreigners visiting Kyoto have sent high quality, Japanese products around the world, which has created an easy-trade environment. We want to respond to further individual company's needs and expand the scale of each company's overseas business in the future."